Orthotics is an effective treatment for a wide range of issues, but they must be prescribed correctly or they can make your problem worse. An orthotic is a device that sits inside your shoe which is designed to support and assist the foot and lower leg muscles to work more effectively. They commonly are made of a plastic like material called polypropylene or a soft material called EVA. Orthotics are often referred to as innersoles or arch supports. Orthotics can be prescribed to help alleviate and prevent foot, ankle, and knee pain and improve your balance and foot function. I have foot pain, does that mean I need an orthotic? No, not necessarily. 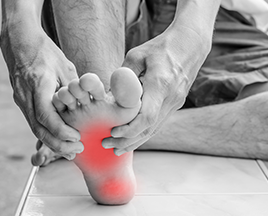 We will assess your foot pain including a thorough history of your complaint and a biomechanical assessment. If we feel orthotics will benefit you then they will be part of your overall treatment plan which may also include a home exercise program, footwear modifications, etc. It's important to know that orthotics are incorporated as part of an overall treatment plan to resolve your foot health issue. Prescription orthotics are just one of several effective methods of managing heel pain. What type of orthotics might I need? Are we trying to change the way your muscles and joints work? Are we trying to offload a painful area on your foot? What shoes will they be put in? What activities are you doing in them? Orthotics is an effective treatment for a wide range of issues, but they must be prescribed correctly or they can make your problem worse. Let us confirm if orthotics are right for you. Take control today by booking in online or call us today on (03) 9457 2336.